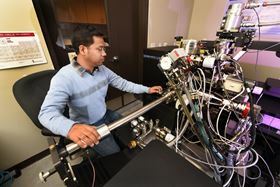 INL materials scientist Subhashish Meher uses a local electron atom probe at the Center for Advanced Energy Studies to study the microstructure of treated superalloys. Photo: Idaho National Laboratory. Researchers at Idaho National Laboratory (INL) have discovered how to make ‘superalloys’ even more super, extending their useful life by thousands of hours. The key is to heat and cool the superalloy in a specific way, creating a microstructure within the material that can withstand high heat more than six times longer than an untreated counterpart. "We came up with a way to make a superalloy that is much more resistant to heat-related failures. This could be useful in electricity generators and elsewhere," said Subhashish Meher, an INL materials scientist who was lead author of a paper on this work in Science Advances. INL scientists have been studying nickel-based superalloys. Since these superalloys can withstand high heat and extreme mechanical forces, they find use in electricity-generating turbines and high-temperature nuclear reactor components. Previous research had shown that their performance can be enhanced if the material structure of the superalloy repeats in some way from very small sizes to very large, like a box within a box within a box. This is called a hierarchical microstructure. In a superalloy, it is produced by a metallic matrix with precipitates, regions where the composition of the mixture differs from the rest of the metal. Embedded within the precipitates are still finer-scale particles that have the same composition as the matrix outside the precipitates – conceptually like nested boxes. Meher and his co-authors studied how these precipitates formed within a superalloy. They also investigated how this structure stood up to heat and other treatments. They found that with the right recipe of heating and cooling, they could make the precipitates two or more times larger than would otherwise be the case, thereby creating the desired microstructure. These larger precipitates lasted longer when subjected to extreme heat. Moreover, computer simulation studies suggested that the superalloy could resist heat-induced failure for 20,000 hours, compared to about 3000 hours normally. These new, heat-resistant superalloys could be used to produce electrical generators that last much longer. What's more, INL scientists may now be able to come up with a procedure that can be applied to other superalloys, allowing them to adjust a superalloy's strength, heat tolerance or other properties to enhance its use in a particular application. This story is adapted from material from Idaho National Laboratory, with editorial changes made by Materials Today. The views expressed in this article do not necessarily represent those of Elsevier. Link to original source. Scientists have made ultra-thin solar cells from gallium arsenide that are flexible enough to wrap around the average pencil.